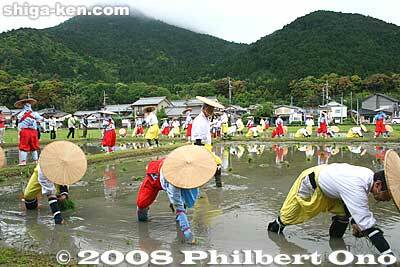 Rice-planting Festival in May. More Yasu photos here. Claim to Fame Mt. Mikami, Local high school won the national high school soccer championship in Jan. 2006. 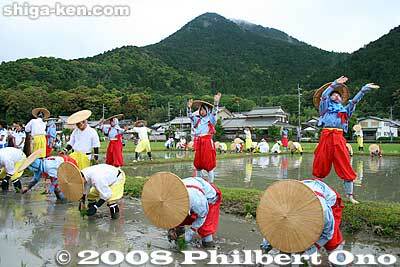 Yasu (野洲市; Yasu-shi) is a city in southeastern Shiga Prefecture on the shore of Lake Biwa. Home to Shiga's Mt. Fuji named Mt. Mikami, alias Omi-Fuji, a conical mountain. It is a fairly easy climb to the summit at 432 meters. Famous locally for the legend about the giant centipede occupying the mountain until a brave warrior from Karahashi in Otsu killed it. Mikami Shrine and Hyozu Taisha Shrine are the city's major Shinto shrines. Yasu was also where Japan's largest ancient bronze bells were unearthed in 1881 and 1962. Yasu also boasts Shiga Prefectural Kibogaoka Bunka Park, a huge and a great place to play and be with nature. More photos at Yasu Photos. 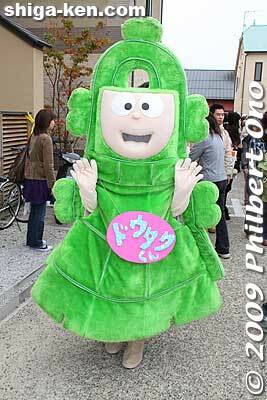 Yasu's official mascot: Dotaku-kun, based on a bronze bell. Jan. 1: Mt. Mikami New Year's Climb 三上山初登山大会 - Climb the mountain to see the New Year's first sunrise (hi node). Last Sun. in Aug.: Children's Sumo Tournament (Kodomo Sumo) 子ども相撲 - Boys from age 5 to 14 wrestle at Miyake Shrine 屯倉神社. Take the JR Tokaido/Biwako Line to Yasu Station. Local buses leave infrequently from Yasu Station's North and South exits. If you want to head toward the lake, go to the North exit bus stops. For inland destinations (Dotaku Museum, Kibogaoka Park, etc. ), go to the South Exit bus stops. 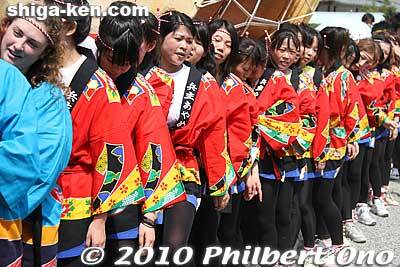 October 1: The towns of Chuzu-cho and Yasu-cho merged to form Yasu city. Yasu-gun was thereby dissolved. 2006 Yasu gained national attention when its high school soccer team won the national championship in Jan.
2008 Yasu hosts in Oct. Sports Recreation Shiga (Sporec 2008), a national sports meet held annually for adults of all ages. Sumo wrestler during the 1980s who got promoted to Sekiwake. Other sights in neighboring cities/towns within easy reach from Yasu. This page was last edited on 7 December 2018, at 01:42.